• identify a self-excited shunt generator from a circuit diagram. • describe the way in which the voltage buildup occurs for this type of generator. • list the causes for a failure of the voltage to build up. • define voltage control and voltage regulation. • draw the basic circuit. Most dc generators of the shunt type are self excited. 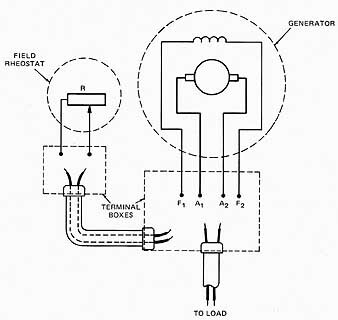 A generator is called a shunt generator when its field circuit's connected in parallel with the armature and load. In the field circuit, itself, a four-pole winding may be connected in series, parallel, or series-parallel. The circuit arrangement of the field windings does not affect the classification of the generator because the field windings, as a group, are connected in parallel with the armature and load. ill 1 shows the schematic diagram of a self-excited shunt generator. Voltage control is obtained with a field rheostat. Unlike the separately excited generator, there is no current in the field circuit when the armature is motionless. Since a small amount of residual magnetism is present in the field poles, a weak residual voltage is induced in the armature as soon as the armature is rotated. This residual voltage produces a weak current in the field circuit. If this current is in the proper direction, an increase in magnetic strength occurs with a corresponding increase in voltage output. The increased voltage output, in turn, increases the field current and the field flux which, again, increase the voltage output. As a result of this action, the output voltage builds up until the increasing field current saturates the field poles. Once the poles are saturated, the voltage remains at a constant level, unless the speed of the armature rotation is changed. If the direction of armature rotation is reversed, the brush polarity also is reversed. The residual voltage now produces a field current which weakens the residual magnetism and the generator voltage fails to build up. Therefore, a self-excited machine develops its operating voltage for one direction of armature rotation only. The generator load switch may be closed when the desired voltage is reached. A shunt generator may not develop its rated operating voltage due to a loss of residual magnetism. The residual flux may be renewed by momentarily connecting a low-volt age dc source across the field circuit. Several methods can be used to renew the residual magnetism. a. Disconnect the field circuit leads from the brushes. b. Momentarily connect a storage battery or low-voltage dc source to the field circuit leads. To maintain the desired brush polarity, connect the positive terminal of the battery to the field lead normally attached to the positive generator brush. a. If it's inconvenient to detach the field leads and the brush assembly can be reached, lift either the positive or the negative brush and insert a piece of heavy, dry paper between the brush and the commutator segments. c. Remove the paper under the brush before restarting the generator. a. If it can be done readily, disconnect the generator from its prime mover. b. Then, restore the residual field by momentarily connecting a battery to the generator output leads. Since the field circuit's connected across the output leads, the current renews the magnetic field. Caution: If the armature isn't free to rotate, damage to the armature assembly may occur. When the battery voltage is high enough in Method 3, the generator armature rotates as a motor. The rotation produced does not contribute to restoring the residual flux. How ever, this effect, called motorizing, is useful because it's a rough check of the overall generator operation. That is, the armature should rotate freely if the voltage applied is a sizable fraction of the rated output voltage, with the direction of armature rotation opposite to the proper direction of rotation for a generator. Use a reduced voltage for large motors. To maintain the original brush polarity when renewing the residual magnetism, the electrical polarities of the output leads and the exciting battery must be matched. In other words, the positive terminal of the battery must be connected to the positive output terminal of the generator and the negative battery terminal must be connected to the negative generator terminal. The motorizing test should never be used for restoring residual flux if the generator armature is mechanically engaged to the prime mover and cannot rotate freely. A strong current through the motionless armature sets up a powerful magnetic field on the armature core. This magnetic field may overpower and reverse the main field flux, causing a reversal of the brush polarity when the generator is restarted. If there is any doubt as to whether or not the armature can be disconnected completely from the prime mover, it's preferable to isolate and energize the field circuit only, either by lifting the brushes or disconnecting the field leads. A shunt generator may fail to reach its operating voltage even though its residual magnetic field is satisfactory. This failure may be due to excessive resistance in the field circuit. Any generator has critical field resistance. The presence of resistance in the field circuit in excess of this critical value causes the generator to fail to build up to its rated operating voltage. Since field rheostats are used to control the voltage output at rated speed, it's important to reduce the resistance of the field rheostats to a minimum value before investigating other possible faults in the event of failure to develop rated voltage. Contact resistance at the brushes is another reason for the failure of the generator to develop its operating voltage. Since the field circuit's completed through the armature, any resistance introduced at this point is effectively in the field circuit. Additional pres sure applied to the brushes may indicate trouble from this source. Improper connection of the field circuit leads at the brushes is also a cause of failure to build up rated voltage. An improper connection can be discovered by reversing these leads. When a dc shunt generator is used in special applications, it may be necessary for the armature to rotate in a direction opposite to that specified by the manufacturer. To develop voltage buildup in these instances, the field circuit leads at the brushes must be reversed. Shunt generators are rated for speed, voltage, and current. Generators used in aircraft and automobiles operate through a wide range of speeds, but must maintain a constant load voltage. Voltage regulators which automatically change field resistance are used. Generators designed for operation at a constant rated speed must not be operated above this value, unless the field circuit's protected from the effects of excessive current by current-limiting devices. Field rheostats are used to control the voltage output of shunt generators. At a given speed, the rheostat can be used only to bring the output voltage to values below the rated voltage obtainable without a field control. Values above the normal rated voltage can be obtained only by operating the generator above normal speed. The terms voltage regulation and voltage control are often confused. Voltage control refers to intentional changes in the terminal voltage made by manual or automatic regulating equipment, such as a field rheostat. Voltage regulation refers to automatic changes in the terminal voltage due to reactions within the generator as the load current changes. E.g., it's inherent in the design of a shunt generator for the output voltage to fall off as the load increases. If the drop is severe, the generator is said to have poor voltage regulation. A self-excited shunt generator has the field coils and the field rheostat shunted across the armature connections. If there is residual magnetism left in the field iron, then spinning the armature will produce residual voltage. This residual voltage is normally enough to begin the generation process. If there isn't enough residual voltage, then the residual magnetism must be re-established. Self-excited generators must have the field polarity correctly established and the armature spinning in the proper direction to develop output voltage. The output voltage can be controlled by adding or removing resistance to the shunt field circuit. Select the correct answer for each of the following statements. b. excited by storage batteries. a. in parallel with a rheostat. b. in parallel with each other. c. in series with each other. b. proper operation of the field rheostat. a. full line current applied. c. one ohm resistance per volt. a. cuts down the magnetic flux. b. decreases the terminal voltage. d. increases the terminal output voltage. a. loss of residual magnetism. b. resistance greater than the critical field resistance. c. rotation of the armature in the direction opposite to that known to cause a voltage buildup. d. brush contact resistance effectively increasing the field circuit resistance above the critical point. e. improper connection of the field circuit leads at the brushes. a. due to the, operation of auxiliary regulating equipment. b. when the terminal voltage is increased. c. when the speed is regulated. d. automatically when the load is changed. a. when speed is regulated. c. automatically when the load is changed. d. when auxiliary equipment is used. a. no change in terminal voltage. b. an increase in terminal voltage. c. a decrease in terminal voltage. d. less change than in other generators. 10. Connect the following self-excited generator by drawing the proper connections in the terminal boxes. 11. Write the formula for percent voltage regulation.